Prep time: 20 minutes. Cooking time: 50-55 mins. Yield: one loaf. 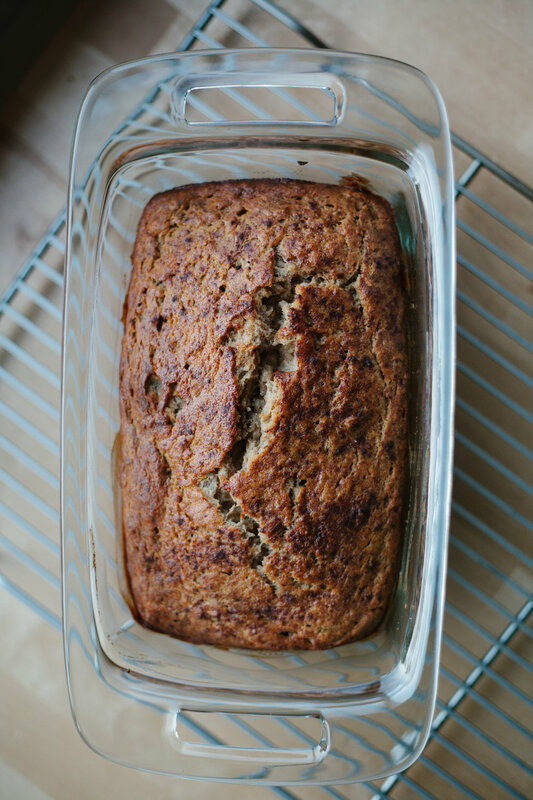 This moist banana bread gets all its good flavour from the fragrant cold-pressed coconut oil and the rich taste of real vanilla bean. 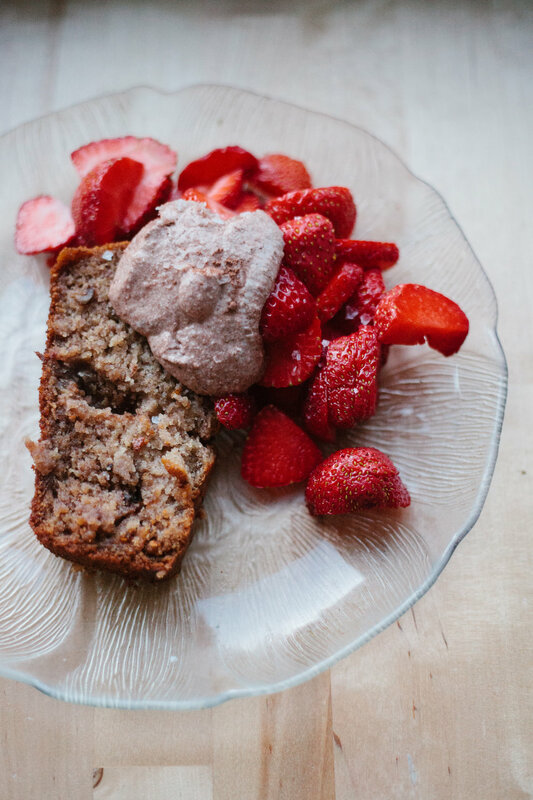 If serving as a dessert, it pairs best with whipped vanilla butter, vanilla cashew cream, or vanilla whipped cream (just mix vanilla beans into any of those to make your own!) and fresh, seasonal strawberries. Gluten-free note: For GF restrictions, I recommend using brown rice flour. It holds the loaf together yet produces a nice crumb, while adding good fibre, protein, and moisture. Our house goes back and forth between all-purpose flour and gf brown rice flour, depending on what’s in our cupboards. 2. Mash bananas in a large mixing bowl and set aside. 3. Slice your vanilla pods down the middle to open. Using a small spoon or butter knife, scrape the beans from each pod and place in banana mixture. Beat with an electric hand mixer until vanilla is well distributed. 4. Add coconut oil and beat on medium speed for 30 seconds to one minute. 5. Add honey or maple syrup, plus one tablespoon of palm sugar. Beat on medium speed for 30 seconds to one minute. 6. Add egg. Beat for one minute. 7. Add sour cream or yogurt. Beat for 30 seconds to one minute. 8. In a separate bowl, combine dry ingredients (flour, cinnamon, baking powder, baking soda, salt) and mix with a fork or whisk. 9. Add dry ingredients to batter and beat on low speed for 1-2 minutes, scraping sides with spatula as needed to make sure all the dry ingredients are incorporated into the wet batter. After 2 minutes, your batter should have the consistency of thick cake batter—not too runny but nice and moist. 10. If adding chocolate chips, fold them into your batter with spatula now. 11. Using your spatula, spoon half of your batter into an 8”x5” loaf pan. 12. Gently fold in lightly roasted walnuts. Mix nuts around with a spoon, and cover with your remaining batter. Make sure all walnuts are covered sufficiently with batter, or they may burn in oven. 13. Sprinkle top with a light dusting of cinnamon and a healthy dusting of palm sugar. 14. Bake for 50-55 minutes. Test loaf with a knife at 45 minutes to ensure sure you don’t over bake your loaf, as home ovens vary. But ours always needs 55 minutes! 15. Let cool for 30 minutes before slicing. In my mind, crème brûlée has got to be both one of the simplest and most decadent desserts to prepare. The rich coffee flavoured custard covered with a layer of bittersweet crunchy caramel is delectable beyond comparison. Pour cream and whole coffee beans into a medium-sized saucepan. Split the vanilla bean lengthwise and use the backside of your paring knife to scrape the seeds from the bean and drop into the cream. Gently heat over low to medium heat being careful not to scald or burn the cream on the bottom of the pot. Stir with either a silicone lined whisk or a wooden spoon to avoid metal on metal, which would produce a slightly metallic taste. While the cream is drawing out the vanilla and coffee flavours, combine the egg yolks and 1/3 cup of sugar in a medium-sized mixing bowl and whisk to combine. Continue to heat the cream mixture for 30 minutes, then allow to rest off the heat for 5 minutes. Strain the cream into another bowl to remove the coffee beans, some of the vanilla seeds will pass through, which is okay. Start by slowly adding the cream a couple of tablespoons at a time to the egg yolks, whisking constantly to ensure you avoid cooking the eggs, then slowly add the remaining cream. Preheat the oven to 350ºF and bring a kettle of water to boil. Place the four ramekins into a roasting pan. Pour the custard into four ramekins and skim off any bubbles that form along the surface. Pour enough hot water into the roasting pan to come up at least half-way up the ramekin. Bake in the oven for 40 minutes or until set. Remove from the oven and allow the custard to cool completely. Sprinkle enough sugar on top of each custard to cover. Light a blow torch to caramelize the sugar, holding the ramekin at 45 degrees and the lit torch in the other. Caramelize the sugar, continually turning the ramekin to get a nice even, golden caramel. See the original recipe on her blog here. Get ready for a treat! As a major bonus it’s also breakfast approved, which is how I’ve been enjoying it this week. Throw on some fresh berries (maybe some coconut cream…) and a handful of nuts to balance it out with some fiber, antioxidants and protein and you’re set for one awesome morning! Add all ingredients except the 1/2 cup of sweetened almond milk to your rice cooker. Once rice cooker turns off, ad remaining 1/2 cup of milk and stir to combine. This will give a nice rich, creamy consistency. 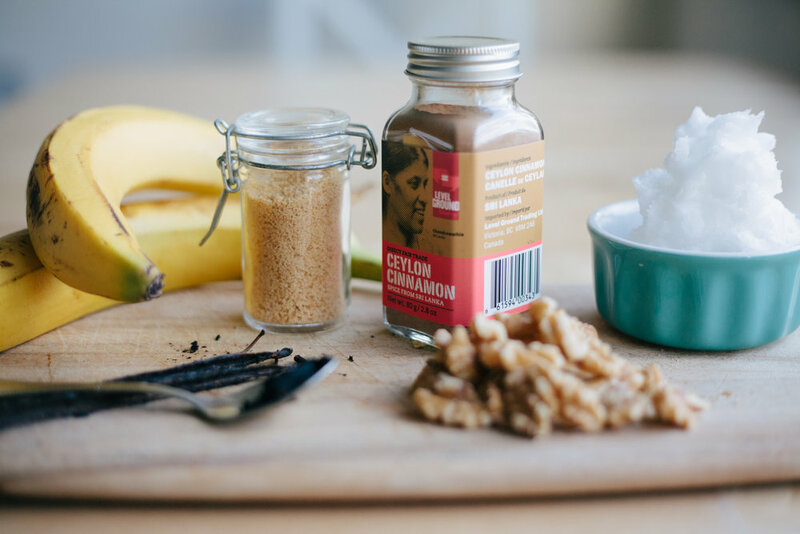 Serve warm with an extra sprinkle of cinnamon. Either you love or loathe marmalade. This is a simple, and delicious version of an old English pantry staple. The golden berries provide an excellent source of pectin and tartness while the vanilla delivers a smooth finish on the palate. Sterilize each jar and lid in boiling water for 10 minutes. Remove from water and allow to cool at room temperature. Bring to a boil the water in a small pot, add the Level Ground Golden Berries and remove from the heat, allowing to steep for 5 minutes. Strain the berries and make sure to reserve the liquid. Using a vegetable peeler, remove the zest from the oranges and then thinly slice the strips. Cut each orange in half and juice (with a reamer, if possible). Place the golden berries and orange juice in a food processor and puree. Pour this mixture and 250 mL of the reserved water into a large pot. Slice the vanilla beans in half lengthwise and scrape out the seeds, adding to the orange/golden berry puree. (You may add the remaining bean scraps into the mixture for additional flavour, but be sure to remove prior to canning). Bring to a boil and reduce for 10 minutes. Add the sugar and continue to boil until the mixture becomes syrupy, approximately 10-15 minutes. Please note, that as the marmalade cools it will thicken. If you all of a sudden reduce too much you may add some water to decrease the viscosity. Pour the warm marmalade into sterilized jars and seal with the lid. Allow to cool at room temperature and as the seal will 'pop' spontaneously. This no-bake pie will be a knock-out punch at any dinner party, and great for any holiday! At my house I've got only one rule when it comes to pie...I don't share. For gingersnaps, preheat oven to 350 ºF. Cream butter and sugar together until smooth. Stir in molasses and beat in the egg. 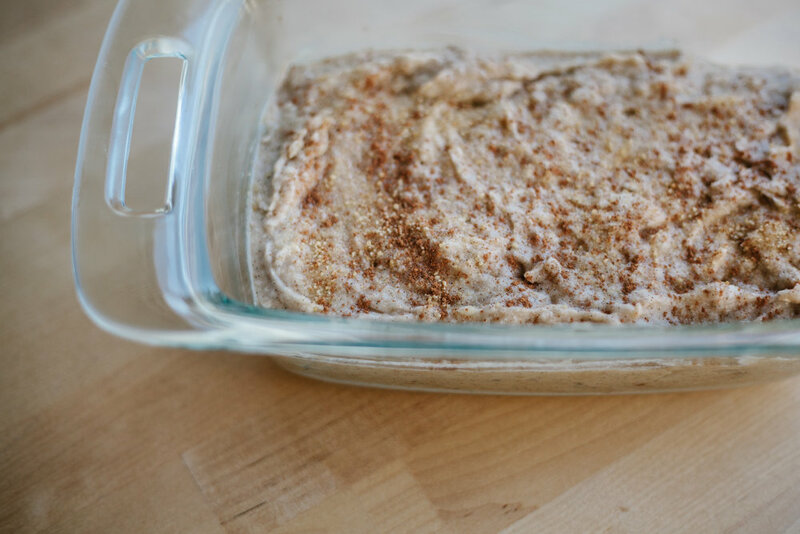 In a separate bowl, combine flour, baking soda, salt and spices. Add to butter mixture and stir just until blended. Shape spoonfuls of dough into balls and roll in sugar. Place 2 inches apart on a greased or parchment-lined baking sheet and press flat with the palm of your hand. Bake for 10 to 12 minutes, until edges are lightly browned and remove from baking sheet to cool. For crust, grind cooled cookies finely and measure out 2 ½ cups of crumbs. Melt remaining ½ cup butter and stir into crumbs. Press into a 9-inch springform pan and chill in freezer until ready to fill. For filling, begin by lightly toasting the ground coconut. In a separate heavy-bottomed saucepot stir sugar, cornstarch and salt together. Whisk in coconut milk, whole eggs and egg yolks. Heat custard on low heat, whisking constantly for 5 minutes. Increase heat to medium and continue whisking until custard thickens and becomes glossy, about 5 more minutes. Remove from heat and strain. Stir in vanilla, coconut oil and toasted coconut and stir until melted and incorporated. Let cool on the counter for 5-10 minutes then pour into pie shell. Cover the top of the custard with plastic wrap to avoid a skin from forming. Allow to chill completely before topping with cream, at least 4 hours. For cream topping, whip cream to medium peaks, and whisk in sugar and vanilla. Top coconut custard with whipped cream and garnish with additional coconut flakes. To remove from the springform pan, run a small palette or paring knife around the edge to avoid tearing of the crust.